This figure consists of three panels. Left panel is the image acquired with 201cm HCT in R band along with the location of SN marked. Middle panel represents the template image which is obtained on February 26, 2017. Right panel shows the difference image received after template subtraction. Credit: Singh et al., 2019. A recent study conducted by astronomers has revealed important observational properties of a Type Ib supernova designated MASTER OT J120451.50+265946.6, which exploded in the galaxy NGC 4080. The research, presented in a paper published March 14 on the arXiv pre-print repository, provides crucial hints about the nature of the supernova, what could disclose the progenitor of this stellar explosion. Supernovae (SNe) are energetic stellar explosions basically classified as Type I and Type II, depending on their light curves and nature of their spectra. Type I SNe are divided into three subclasses: Ia, Ib and Ic. Type Ia and Ib are caused by the core collapse of massive stars, and in the case of Ib, they are generally hydrogen deficient with prominent helium features in their early time spectra. MASTER OT J120451.50+265946.6 (or M12045 for short) was detected on October 28, 2014 by the MASTER-Tunka auto-detection system as an optical transient (OT) source. Afterward, the transient was classified as a Type I SNe that exploded in the Magellanic spiral galaxy NGC 4080, which is located some 50 million light years away from the Earth. 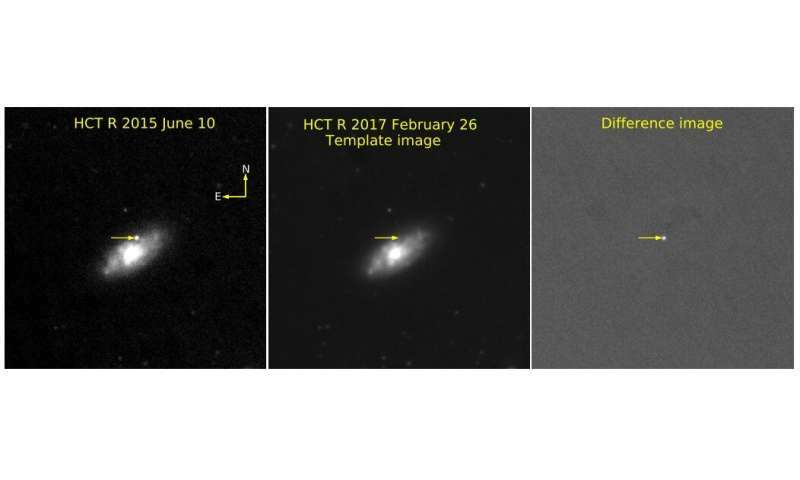 In order to uncover more insights into the nature of M12045, a team of astronomers led by Mridweeka Singh of Aryabhatta Research Institute of Observational Sciences (ARIES) in India, has analyzed the available data from photometric and spectroscopic observations of this supernova. The studied dataset, acquired using the 104-cm Sampurnanand Telescope (ST) and 201-cm Himalayan Chandra Telescope (HCT) located in India, includes a period up to 250 days since the explosion reached its maximum. "In the present work we discuss the results obtained for a Type Ib SN M12045 based on the photometric and spectroscopic observations. M12045 is one of the few Type Ib SNe with a rich spectroscopic data set spanning up to ~250 days since Bmax." the astronomers wrote in the paper. The researchers were able to capture the linearly declining light curves of M12045 in B, V, R and I bands. They found that when compared to other typical Type Ib SNe, such as 1999dn and 2009jf, M12045 declines faster at comparable epochs. The study confirmed that M12045 is a normal Type Ib SN. The observations indicate that spectroscopic evolution of this supernova is similar to a typical Type Ib SN with enriched features of helium, oxygen, magnesium and calcium. Additionally, the astronomers calculated that M12045 ejected about 90 solar masses of oxygen during explosion. According to the paper, results of the analysis in general support the hypothesis that a progenitor of M12045 is most likely a Wolf–Rayet (WR) star. In this case such star could have a main sequence mass of some 20 solar masses. "The mass of neutral oxygen, the flux ratio of [Oi] and [Caii] lines and sub-solar metallicity suggests that the progenitor of M12045 could be a massive WR star with a zero age main sequence mass of ~20 solar masses," the researchers concluded. From article: "Additionally, the astronomers calculated that M12045 ejected about 90 solar masses of oxygen during explosion." From abstract: "The analysis of the nebular phase spectra indicates that ∼ 0.90 M⊙ of O is ejected in the explosion."